The following is a first hand account of the Operation Varsity battle in which Eldy was killed. When we arrived in France in February 1945, I felt that there would be no more large airborne combat missions ahead of us. I thought that our job was now to continue flying needed supplies to the troops on the front line. If they needed gasoline, we would load up our planes with 5 gallon jerry cans and land in a cow pasture, if necessary, to make the deliveries. It didn't matter what was needed, ammunition, food, medical supplies; we would deliver to any unit that needed our help. But, then a rumor about a possible airborne invasion across the Rhine River began to circulate. When we looked at the daily battle maps in the Stars and Stripes newspaper, we could see that to cross the Rhine River, an amphibious force could very well need airborne support to successfully secure an area ahead of the landing craft which were to follow. It would be just like D-Day Normandy, except that we would be crossing the Rhine River instead of the English Channel. After flying all the previous missions without self-sealing gasoline tanks, our aircraft were finally scheduled to receive them. The crew chiefs and their assistants worked long and hard for many, many hours to remove the old wing tanks, and to install the new self-sealing gasoline tanks. When "Monty," George Montgomery our crew chief, removed the metal strap holding the old gasoline tank in the left wing, a spent bullet that had penetrated our plane on D-Day was found. I have always wondered what would have happened if that bullet had gone into the tank, instead of just wedging between the tank and the steel strap. With the installation of self sealing gas tanks in progress at an accelerated pace for all the airplanes of the 437th Troop Carrier Group, it seemed likely that a combat mission was not just a rumor but a reality that we must face one more time. For whatever reason, I did not feel good about the upcoming mission. I had a dull, sort of empty feeling in my stomach, which would not go away. Call it butterflies, call it what you like, I guess that I was just plain scared that my luck was finally about to run out. We had been so lucky on D-Day, the airborne parachute invasion of Southern France, the airborne invasion into Holland, the resupply of the 101st Airborne at Bastogne, but now, I felt that my luck was about to run out. After the briefing for Operation Varsity, the airborne assault across the Rhine River at Wesel, Germany on the evening of March 23rd, I went to church and prayed that I would survive the mission; but, if I did not, that God would forgive me my sins, and take me to heaven. At the service, I met a young 2nd lieutenant, a pilot, who had just joined our outfit. He told me that he would be flying the mission, too, and that he was really frightened. 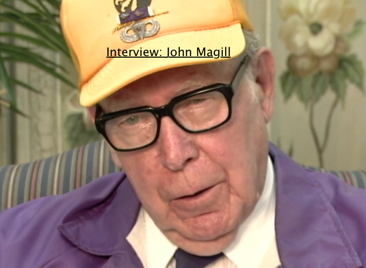 He said that he had been checked out to fly as a co-pilot on a C-47, but that, because there was a shortage of glider pilots, he was going to be flying as a co-pilot on a CG-4A Glider tomorrow morning. He said that he had never been in a glider before, and that he had not had the infantry training that the regular glider pilots had completed. This was his first mission. I don't know whether he made it or not, but I truly hope he did! On March 24, 1945, we lined up all 72 of our C-47s on the runway at A-58, Coulommiers, France. We had two CG-4A Waco Gliders attached to each C-47. The marshaling of so many airplanes and gliders on the runway at the same time left us with a lot less runway length to get two gliders off the ground at the same time, and to be able to get up sufficient speed to get the C-47 into the air. There were a lot of tall trees at the end of the runway, and I knew that we have to be able to get both gliders, and the C-47 into the air before crashing into the trees at the end of the runway. I watched from the astro dome as the first C-47 and its two gliders lumbered down the runway at full throttle, 50 inches of mercury!! When it was our turn to take off, we pulled forward until the towropes had no more slack. Then, pilot Captain Floyd Kelly and co-pilot, Major Joe Antrim gave us full throttle and the airplane began to move slowly, but gradually picked up speed. Two fully loaded gliders, plus the gross weight of the airplane, was a challenge for our two Pratt and Whitney engines to get us all into the air before we reached the trees at the end of the runway. The two gliders were into the air relatively soon as our C-47 struggled to pick up sufficient speed to get airborne. As we neared the trees, Kelly pulled back on the controls and we sort of "mushed" into the air over the trees. We gained altitude, and joined up with our formation on its way to Germany. It was to be a long mission. 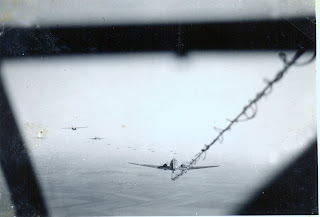 I don't remember how many hours that it took to get to Germany, but I remember that the turbulence from so many airplanes and so many gliders flying together at the same time caused our gliders to bounce around violently, which caused their tow ropes to constantly jerk the tail of our aircraft in all directions. The C-47 pilots had their hands full, trying to keep the airplane straight and level, but the glider pilots were having a life and death struggle to control their gliders in the worst turbulence that any of them had faced in previous combat missions. 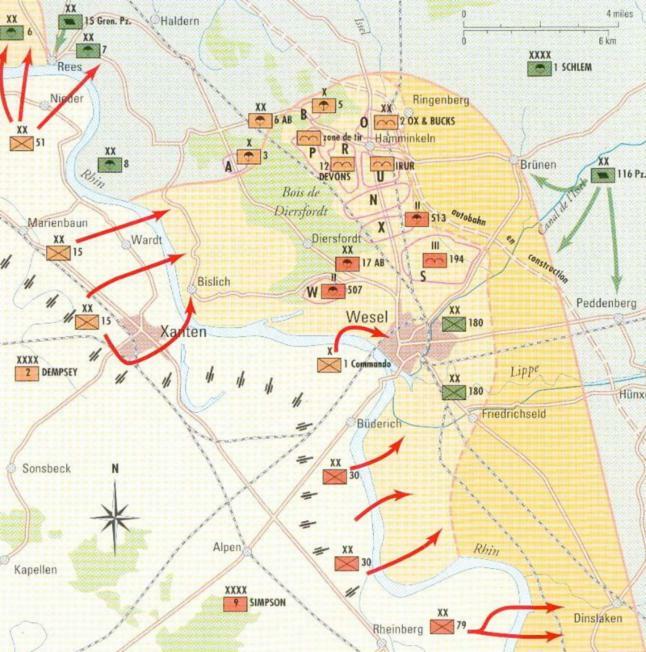 And, it seemed that we would never get to the Rhine River and the LZ. Before we got to the Rhine River, we began to notice a lot of smoke, and I could tell that the combat area was not far ahead. I stood up in the astro dome and could see the Rhine River and lots of action up ahead. We still were not encountering any ground fire, but I could see that we would soon be crossing the Rhine with our two gliders bouncing around behind us. All of the sudden, it was like D-Day Normandy again. The ground fire was extremely intense, and I thought to myself that this is worse than Normandy, and, also, it is in daylight, and the Germans can see us!! It was extremely smoky, and visibility was limited because of the smoke, but we reached the LZ, and our gliders cut loose. They were just as glad as we were that they were finally cut loose and not a sitting duck at the end of a towrope. We made our turn, dropped our towropes in the assigned area, crossed the Rhine River and headed for home! We had made it!! I couldn't believe that the German gunners were not able to shoot us down since we were flying so low, and so slow. We were just lucky, I found out later! When we finally returned to Coulommiers, after a very long and dangerous flight, it felt good to get something to eat and head for our tents. Many of our C-47 crews had still not returned to our base that night. Radio operator, Chuck Salerno's cot was empty in our tent that night. We found out the next day that he had bailed out over Germany, but we did not know for several days that he survived, had joined up with American forces, and would be returning back to Coulommiers as soon as he could. Radio Operator Jim Lyons had been shot down and was in a hospital with the rest of his crew, all badly injured. My friend, Captain Victor Deere and his co-pilot Lt. Eldred Trachta were shot down and both killed. Crew Chief Gerry Cataline and his crew were shot down and crash-landed in a school yard in Bon< Germany. Radio Operator George Babich and his crew made an emergency landing with the gasoline control valve shot out. There were so many more, but I do not know their names. 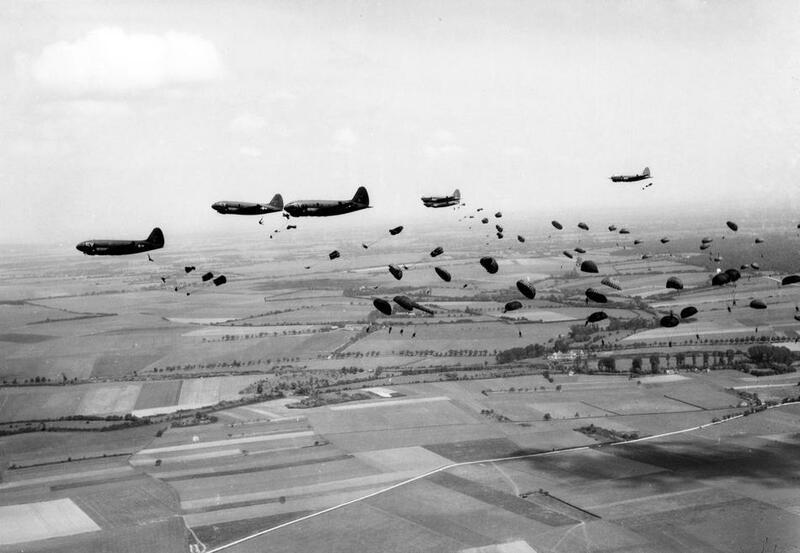 Operation Varsity was the largest airborne operation in history. Usually we worked with the 82nd or the 101st Airborne, but on this mission, it was the 17th Airborne who we delivered to the LZ. They did great!! There were heavy losses suffered by Troop Carriers during Operation Varsity. Approximately 35% of all the C-47s were lost or damaged in our last combat mission of World War II. Somehow, I always feel the saddest for those guys that were lost on our last combat mission. If only they could have survived just this one last mission!! If only they could have been as lucky as I was!! I will never forget them!! Prior to deploying to France, Eldy was stationed at Ramsbury Airfield in England (see also Airfield, and France). There is a war memorial to the fallen members of the 437th in the Ramsbury parish church, Holy Cross. Eldy's name is listed on a plaque entitled, "The members of the 437th Troop Carrier Group who lost their lives in World War II." One of his comrades is commemorated here. We have the identification of the aircraft he was co-piloting, but little else.